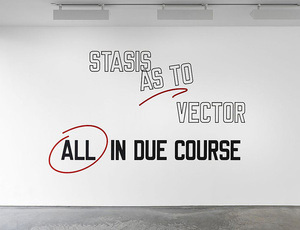 Lawrence Weiner’s texts have appeared in all sorts of places over the last five decades, and although he sees himself as a sculptor rather than a conceptualist, he is among the trailblazers of the 1960s to present art as language. He defines his sculptural medium simply as ‘language + the material referred to’ in the sense that language is a material for construction. Accordingly, his first book Statements (1968) contains 24 typewritten descriptions of works, where only a few had actually been made, suggesting that a work’s existence requires a readership rather than a physical presence. Self-taught as an artist, his urgency to make art broadly available and engaging stems, he says, from his childhood in the South Bronx: “I didn’t have the advantage of a middle-class perspective. Art was something else; art was the notations on the wall, or the messages left by other people. I grew up in a city where I had read the walls; I still read the walls. I love to put work of mine out on the walls and let people read it. Some will remember it and then somebody else comes along and puts something else over it. 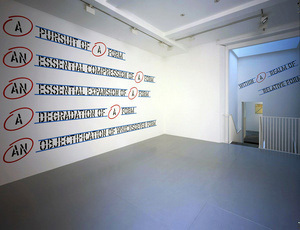 It becomes archaeology rather than history.” (2013) While Weiner's works exist only as language and can be displayed in any form, he is closely involved in manifestations, detailing the size of the font, the surface texture and placement of the paint or vinyl letters and indeed often inventing new fonts. Texts appear on walls and windows of galleries and public spaces, as spoken word in audio recordings and video, printed books and posters, cast or carved objects, tattoos, graffiti, lyrics, online, ad infinitum. 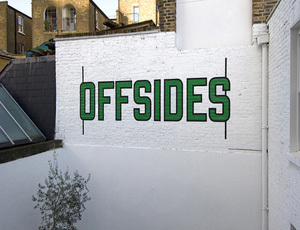 Lawrence Weiner was born in 1942 in New York, NY, USA, where he lives and works today. Solo exhibitions have been held at Pérez Art Museum, Miami, FL, USA (2017); Milwaukee Art Museum, Milwaukee, WI, USA (2017); Kunsthaus Bregenz, Bregenz, Austria (2016); Regen Projects, Los Angeles, CA, USA (2016); Blenheim Palace, Oxfordshire, UK (2015); Stedelijk Museum, Amsterdam, The Netherlands (2014); Museu d’Art Contemporani de Barcelona, Spain (2013); Haus der Kunst, Munich, Germany (2007); Whitney Museum of American Art, New York, NY, USA (2007); Museo Tamayo Arte Contemporaneo, Mexico City, Mexico (2004); Kunstmuseum Wolfsburg, Germany (2000); Walker Art Center, Minneapolis, MN, USA (1994); and Hirshhorn Museum and Sculpture Garden, Washington DC, USA (1990). He participated in documenta 5, 6, 7, and 13 (1972, 1977, 1982, 2012); the 36th, 41st, 50th and 55th Venice Biennales, Italy (1972, 1984, 2003, 2013); and the 27th Biennale de Sao Paulo, Brazil (2006). Among many honours he was awarded fellowships from the National Endowment for the Arts (1976, 1983), a Guggenheim Fellowship (1994), the Wolfgang Hahn Prize, Museum Ludwig, Cologne (1995), a Skowhegan Medal for Painting/Conceptual Art (1999) and an Honorary Doctorate of Humane Letters from the Graduate Center, City University of New York (2013).